Adam reviews the newest South Korean thriller from director Park Hoon-jung, V.I.P.. The intense procedural thriller stars Jang Don-gun, Kim Myung-min, Park Hee-soon and Lee Jong-suk. The film played as a part of the Midnight programming at AFI Film Festival 2017. The newest film from South Korean filmmaker Park Hoon-jung is everything that you would expect from the writer behind I Saw the Devil. Much like that now classic Korean procedural, Park takes the “Cop vs. Serial Killer” breathing life into the tired genre. The film tracks the complicated and messy investigation into a serial killer being hunted by both North Korean and South Korean Detectives. 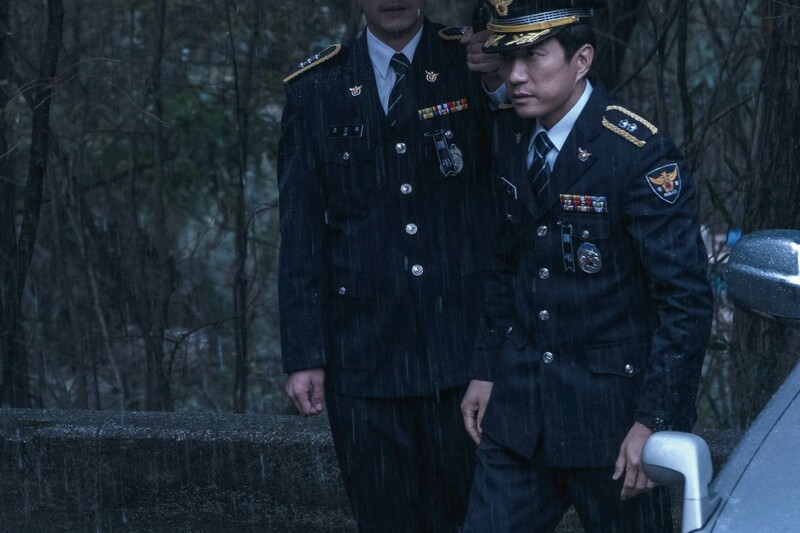 Park adds this timely layer onto the proceedings making every move that Detective Chae Yi-do (Kim Myung-min) and Officer Ri Dae-bum (Park Hee-soon) almost impossible as they are mired in policy and possible interference by Intelligence Agencies (that may or may not be C.I.A.). The way that Park handles this layer is nothing short of miraculous. It never is overly complicated but adds so much to this classic genre tale. The film is a procedural but does not shy away from the gruesome nor the violent. Park’s fascination with serial killers and those that hunt them (illegally or legally) continues to evolve. In V.I.P. Park has found the perfect killer in Lee Jong-suk. Lee’s performance is blisteringly good. The blank empty smile that Lee imbues Kim Kwang-il with is more unsettling than most of what you will see in theaters in 2017. The calm veneer that is slowly chipped away at makes for one of the most compelling villains in some time. Much of what makes V.I.P. work is that it balances Lee performances with three equally stellar performances in the three Officers tracking him. Jang Dong-gun, Kim Myung-min and Park Hee-soon are every bit the equal of Lee. Each actor shares equal screen time each given fully realized characters each hunting down the young killer for their own reasons. To discuss the nature of their roles and the way in which they collude and collide would be giving away too much of what Park has waiting for any adventurous viewer. V.I.P. is the “Cop vs. Serial Killer” refreshed and ready to destroy a willing audience. Park has taken those genre conventions known so well by fans of the genre and twisted them just enough to make them new again. Told on an international stage spanning years and done with more intelligence than your average action film. V.I.P. brings the sound and the fury for those willing to buckle up and take the ride. TagsAction • Cop • Cop vs Serial Killer • I Saw the Devil • Jang Don-gun • Kim Myung-min • Korean • Lee Jong-suk • Park Hee-soon • Park Hoon-jung • Police Procedural • Serial Killer • Thriller • V.I.P.